Plant foods are full of fiber and all sorts of vitamins and minerals. They contain the chemicals which give them their vibrant colours. Plant foods are full of fiber and all sorts of vitamins and minerals. They contain the chemicals which give them their vibrant colours. These chemicals are called as phytochemicals which possess some pretty special qualities. These substances occur naturally only in plants and may provide health benefits beyond those that essential nutrients provide. In relation to plant produce, a variety of colours in one’s diet seems to equal better overall health. Each colour gives its own unique health benefits to a plant food. So “eating a rainbow” every day means providing your body with all the essential nutrients it needs. Pulses: Pulses are a great source of protein, complex (healthy) carbohydrates, several B vitamins, vitamin K, calcium, iron and zinc. They offer an excellent nutrition package and contain natural phenolic compounds and carotenoids that are responsible for their colour. Brown, black and red colours mean significantly more powerful antioxidants and anti-inflammatory properties than pale colours such as white, yellow and light green. These different pigments have been linked to their different health-protective assets such as a lower risk of cardiovascular disease, type-2 diabetes and even cancer. Different colours of pulses indicate different nutrient profiles. So focus on getting a little of each colour of pulse in your diet every day to maximise the nutritional benefits. Fruits: Eating an array of colours just ensures that you get the benefits of each of them. Red fruits, such as watermelon, strawberries and cherries are likely to be rich in antioxidants like lycopene and anthocyanins. Most orange and yellow fruits like oranges and mangoes are rich in beta-carotene which your body converts to vitamin A. They are good for eyes, skin, teeth and bone health. They also contain folate, an antioxidant that may prevent neural defects in unborn infants. Blue and purple fruits like blueberries contain anthocyanins, natural plant pigments with powerful antioxidant properties that may reduce the risk of cardiovascular disease. They contain flavonoids and ellagic acid, compounds that may destroy cancer cells. Anthocyanins and ellagic acid in blue and purple hued fruits also contain anti-inflammatory properties that have been shown to prevent or fight various types of cancers. White fruits like banana, apple and pear have dietary fiber in high quantity, helping to protect from high cholesterol. They also contain antioxidant-rich flavonoids that may lower your risk of stroke. Vegetables: Eating vegetables daily will improve your health but healthy eating is not only about how many serving you eat. It is about the variety you pick. Eat a diet of colourful vegetables. Your different meals should include a range of vegetables in varying hues. Vegetables contain little fat, sodium and cholesterol. They provide fiber, nutrients and complex carbohydrates. Green vegetables are good for your eyes, bones and teeth and their vitamin K content helps your blood to clot properly. These veggies are rich in source of antioxidant vitamins particularly vitamin C and E, that may lower your risk of chronic diseases. They provide the phytonutrients leutin and zeaxanthin, which may protect you from vision loss due to macular degeneration. Purple vegetables such as brinjal and beet contain anthocyanins and ellagic acid that may reduce your risk of cardiovascular disease and destroy cancer cells in the lungs, stomach, breast, pancreas, oesophagus and colon. White vegetables like radish are high in dietary fiber helping you to protect from high cholesterol. Orange and yellow veggies like carrots and bells peppers are rich in beta-carotene that helps in improving night vision and keep teeth, bone and skin healthy. Red vegetables like tomatoes and red capsicum are rich in antioxidants – like lycopene and anthocyanins that help your body to make vitamin A.
Grains: Eating an array of colours in grains just ensures that you get the benefit of all of them. Each grain giving its own different hue has its own little specialities. For example, white-hued oats are high in manganese, essential to the formation of bones and cartilages and to many other functions. Tan or brown in colour, whole wheat is rich in selenium that helps regulate thyroid function and prevent cellular damage from free radicals. Light brown coloured whole barley is highest in fiber and multi-coloured variety in quinoa trumps them all in folate. So, how can we say which one is healthiest? Eating should be a pleasurable experience with an array of colourful variety in whole grains category. Nuts and seeds: Nuts and seeds have been part of the human diet since Palaeolithic times. A few nuts such as almonds, walnuts and seeds, namely flax and chia, get most of the glory, but the fact is that each nut and seed brings something beneficial to the table. They all are a rich source of heart-healthy fats, fiber, plant-protein, essential vitamins and minerals and other bioactive compounds, including an array of phytochemicals that appear to have antioxidant and anti-inflammatory properties giving every seed and nut a different hue and thus different nutrient composition. The whole colourful variety – white, brown, light brown, black, cream, yellow asks you to consume almonds, Brazil nuts, cashew nuts, chia seeds, flax seeds (ground), hazelnuts (Filberts), hemp seeds, peanuts, pecans, pistachio nuts, pumpkin seeds, sesame seeds, sunflower seeds and walnuts so as to enjoy a variety of health benefits that are essential for maintaining a healthy lifestyle. Do not worry! Every single meal of yours need not be multi-coloured. Of course! You can complement every menu by adding a plate of salad with different coloured veggies. 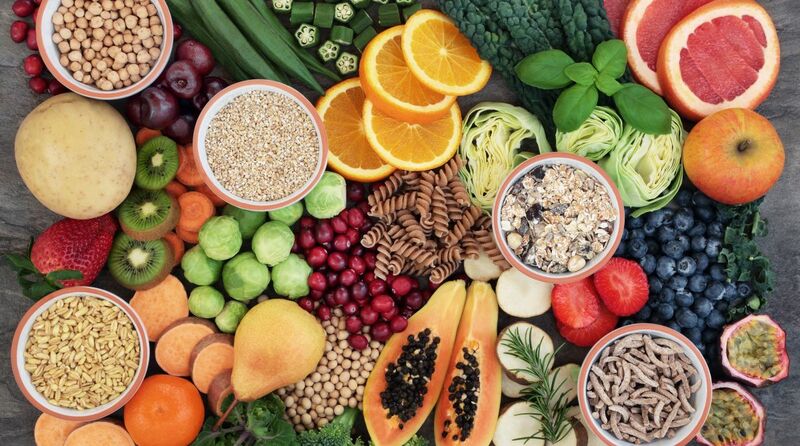 Eating an array of hues means getting a wide range of different grains, seeds, nuts, legumes and pulses, fruits and vegetables in varying colours over the course of a week. The most vibrantly coloured plant foods have the most nutrition. A colourful, balanced diet is linked with good health. If you base your diet largely on a rainbow of plant-based minimally processed whole foods, fruits and vegetables, there is no need to count calories. Relax with family and friends while enjoying these healthy and delicious foods which are not only a treat to your taste buds but to your eyes as well. The colourful variety in vegetarian food is always better than monotony, to achieve a broader array of health.